Yesterday I did indeed end up in Oklahoma City, Oklahoma. I didn’t have enough hours to run the rest of the way to Joplin so I stopped early and finished the rest this morning. The good folks in the inspection bay at our HQ looked over my tires and sent me over to the tire shop. They caught an impressive gash in one of my rear tires but missed some worrisome marks on my left steer. The guy in the tire shop looked it over and quickly concluded that it was time to replace, so I ended up with two fresh steer tires and one used rear super single that matched the tread depth on the other side. The super single was one of the originals on the truck, having provided about 293,000 miles of service. Its opposite number is still doing well and will probably last another 20,000 or so. I checked in to the local Holiday Inn that CFI has used as long as I’ve been a driver, only to find out they have changed the corporate account over to a different motel. Holiday Inn is still honoring the same rate for CFI / Conway drivers and I definitely won’t be changing over. The rooms, food and service here are superior. 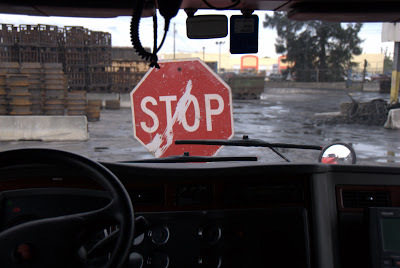 The title of this post typically brings anxiety and fear to the mind of most truckers. After I had dropped my trailer in Nogales, Arizona, I went over to our drop lot and picked up the new one, bound for Kentucky but via Joplin so I can take my time off. I did my usual pretrip, checked the tires, lights, brakes and such then took off up I-19 towards Tucson. 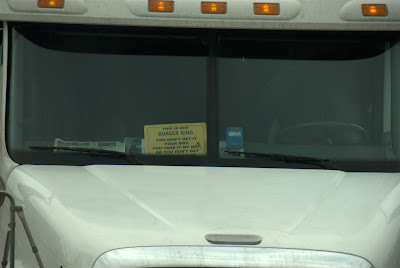 About halfway there is a rest area, and the northbound side had signs instructing all commercial vehicles to pull off for inspection, and a dozen or more DOT agents milling around. And a lot of trucks with their hoods open for inspection. They had a portable truck scale there, which I didn’t care about since my load is not even 20,000 lbs and I couldn’t possibly be overweight on any of my axles. I had my window rolled down and the two officer types there mentioned that as soon as I had scaled I was to pull in to one of the truck parking spots and they would “be right along.” Oh goody. What followed was about 30-40 minutes spent checking all my lights, brakes, air system, drivers license, medical card, registrations and permits but not, for some reason, my logbook. I have my computer sitting on a special automotive desk in my passenger seat with the screen on my electronic logbook and once the officer saw that he didn’t even bother getting a printed copy from me. Which wouldn’t have been a problem since I run legit, anyway. In the end I was given a completely clean bill of health and a printed report I have to turn in to HQ to have them review it and mail it back to the DOT folks. Oh, and a cute green sticker thing on my windshield… kind of like a gold star in elementary school, I guess. Anyway, I drove and drove and drove, using up all my 11 driving hours for the day. I made it to the middle of New Mexico where I am stopped for the night. Tomorrow I will finish up in Oklahoma, then I will pull in to Joplin early Wednesday morning. I started in towards Nogales early in the morning and arrived by 0630 local time. The border transfer company we use here doesn’t open until 0800 though. The satellite unit went off as I was closing in with a load plan heading towards Kentucky. I told my fleet manager I needed to be back in Joplin this week so I will see if I can get it relayed there. 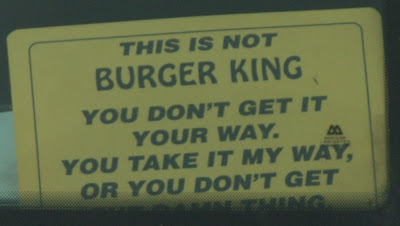 After we back up to their dock to get loaded a forklift picks up a metal base with one of these signs and sticks it in front of your truck. So you don’t drive away with one of the loaders in the trailer, apparently. What gets me is the fact that the sign is all dented and scratched up. (“one damn thing” is the last line I believe). 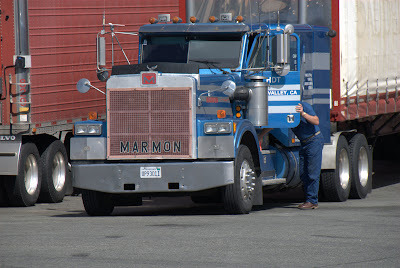 Marmon was a small company that produced semis in the second half of the 20th century (Wiki here). They were considered by some as the Rolls-Royce of trucking and were produced in small numbers by hand, with considerable attention devoted to the details. Today I drove from Big Spring, Texas to Lordsburg, Arizona in heavy wind from the southwest. I’m hauling just over 32,000 lbs of tires which is enough to keep the trailer in line and not rocking too badly, but there is a limit to everything. I could have gone on for two more hours but there wasn’t much point. In the past eight days I’ve driven almost 4,000 miles and I’m out of hours. I get back six hours tonight at midnight which would let me finish the trip to Nogales but then I would be low on hours Monday morning after I deliver. Instead, I’m going to stay put here until Monday morning to reset my hours then finish it off then.